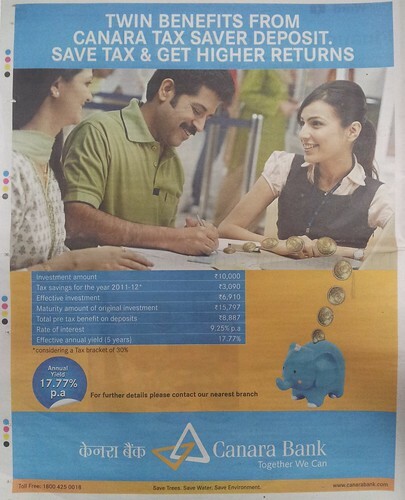 I happened to see the below ad for a 5-Year Tax-Saving Fixed Deposit from Canara Bank. Whenever I see such calculations for a financial product, my first instinct is to try and figure these out by myself. Upon a first and casual glance, the ad seems to boldly project that everyone who invests would get the high yield projected (and there seems to be an error in the calculated yield as we’ll see below). But that’s not so. If you happen to be in the 10% or 20% income-tax bracket your effective yields are much lower. First, some basics. The ad does not specify the compounding interval but plugging-in a quarterly compounding interval tallies up the figures (see: maturity amount of original investment). Next, if you happen to be in the 30% income-tax bracket, the effective annual yield works out to a cool 17.98% (not 17.77% as depicted in the ad; I verified this through alternative formulae too). But if you happen to be in the 20% income-tax bracket, the effective annual yield drops to 14.75% (and conveniently not shown in the ad). And finally, if you happen to be in the 10% income-tax bracket, the effective annual yield drops to 11.98% (again conveniently not shown in the ad). A misguiding ad in my opinion but then most are. The elephant in the ad could have easily given way to two other columns of information! What do you think? Here’s a chance to win a great personal finance book that I’m currently reading and reviewing. It’s India-specific, very recently published, and very timely. I think you already know which book I’m talking about. Here’s how you can win this book: In the income-tax-slab specific tables above, what’s the formula for calculating the APR? That’s it. The first two correct entries win a copy each. I’ll announce the winner next Friday along with a detailed review of the book. And as always, I will need your email address. Once you have the APR, the APY is easy to calculate. Use this formula or if you’re lazy simply install this application for your Android-phone. I’ll also publish the full spreadsheet once the winners are declared. Update: Announcing the winners of this book giveaway — congratulations Raghu and Rakesh. You win a copy of the book “Jago Investor — Change Your Relationship With Money” each. I’ve emailed you separately for your mailing address. Thanks for participating. And here’s my detailed review of “Jago Investor — Change Your Relationship With Money”.